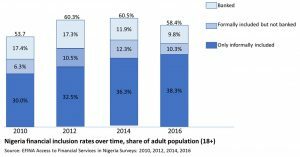 Will the Introduction of Payment Service Banks Improve Financial Inclusion in Nigeria? 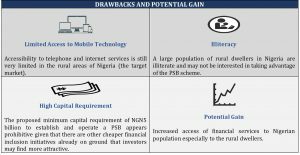 On 5th October, 2018, the Central Bank of Nigeria (“CBN”), as part of its strategy of boosting the financial inclusion rate in Nigeria, exposed the draft Guidelines on Licensing and Regulation of Payment Service Banks (“PSBs”) with a view of ensuring that over 80% of bankable adults (eligible to own bank accounts) in Nigeria have access to financial services by the year 2020. 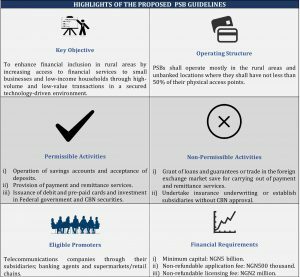 The draft Guidelines set out the framework for the establishment and operation of PSBs in Nigeria. The below infographic provides highlights of the draft PSB Guidelines with further details in the article that follows. According to a World Bank report (the Global Findex Database 2017), nearly half of about 1.7 billion unbanked population in the world live in just seven developing economies: Bangladesh, China, India, Indonesia, Mexico, Nigeria and Pakistan. In a bid to drive financial inclusion rate upward, the Central Bank of Nigeria (CBN), on 23rd October, 2012 – in collaboration with other stakeholders – launched the National Financial Inclusion Strategy (NFIS) with a view to ensuring that over 80% of the bankable adults in Nigeria have access to financial services by the year 2020. In other words, the aim of the NFIS is for the financial exclusion rate of bankable adults in Nigeria to be reduce to 20% by that year. As part of its strategy to achieve this target, the CBN has been promoting several financial initiatives inthe financial system such as, microfinance banking, agent banking, tiered know-your-customer requirements and mobile money. It is proposed that PSBs will operate mostly in the rural areas and unbanked locations with not less than 50% physical access points in “rural areas” as defined by the CBN from time to time. They can also establish Automated Teller Machines in some of these areas (Clauses 3(i) and (ii) of the proposed Guidelines). PSBs are also at liberty to operate through banking agents in line with the CBN Guidelines for the Regulation of Agent Banking and Agent Banking Relationships in Nigeria (“Banking Agent Guidelines”) and use other channels, including electronic platforms, to reach out to their customers. Invest in Federal Government of Nigeria and CBN securities and carry out such other activities as CBN may from time to time prescribe. Establish any subsidiary except as prescribed in the CBN Regulation on the Scope of Banking and Ancillary Matters, No 3, 2010. 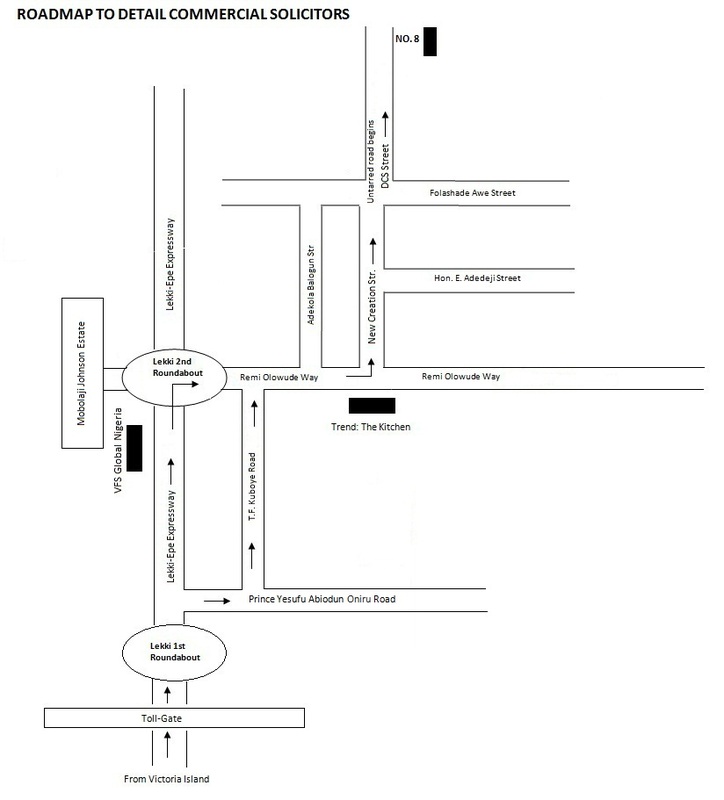 Non-refundable licensing fee: N2 million. Accordingly, it is hoped that the introduction of PSBs into the financial services sector should go a long way in boosting the financial inclusion drive of the country. The proposed Guidelines gives the CBN the power to determine rural centers and unbanked locations within which a PSB is required to have not less than 50% of its physical access points., However, the drawbacks highlighted below may militate against the full success of the PSB scheme.